Most chief executives are now focused on growth during 2017. New growth is the primary business priority for 58 percent of CEOs, according the latest market study by Gartner -- note, that's up from 42 percent of CEOs in 2016. Moreover, product innovation and technology are gaining in significance. "IT-related priorities, cited by 31 percent of respondents, have never been this high in the history of our CEO survey," said Mark Raskino, vice president at Gartner. "Almost twice as many CEOs are intent on building up in-house technology and digital capabilities as those plan on outsourcing it (57 percent and 29 percent, respectively)." Gartner analysts refer to this trend as the re-internalization of IT -- the process of bringing the capability back toward the core of the enterprise because of its renewed importance to achieving a competitive advantage. It's essentially the digital technology skills and capabilities that more forward-thinking senior executives crave. Forty-seven percent of CEOs are directed by their board of directors to make rapid progress in digital business transformation, and 56 percent said that their digital improvements have already delivered profits. Although a significant number of CEOs still mention eCommerce, more of them align new IT infrastructure investments to advanced commercial activities -- such as digital product and service innovation, exploring the Internet of Things (IoT), or adopting digital platforms and associated supplier ecosystems. 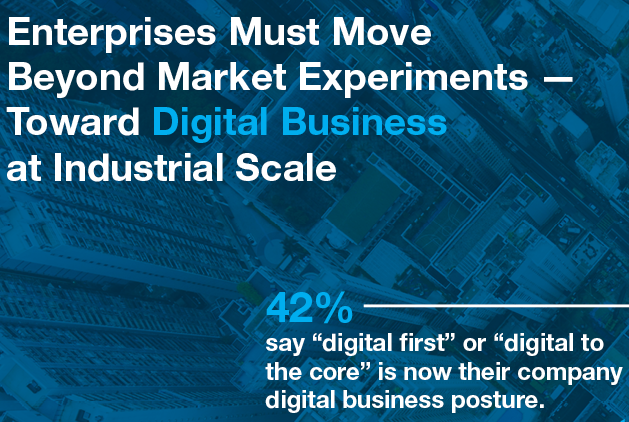 According to the Gartner assessment, some CEOs have already advanced their digital business agenda -- 20 percent of CEOs are now taking a digital-first approach to business development. "This might mean, for example, creating the first version of a new business process or in the form of a mobile app," said Mr. Raskino. 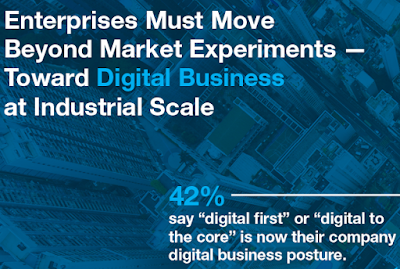 Furthermore, 22 percent are applying digital business technologies to their traditional processes. That's where the product, service and business models are being changed, and the new digital capabilities that support those are becoming core competencies. Although more CEOs have articulated their digital growth ambitions, the survey found that nearly half of the respondent CEOs have no digital transformation success metric. In contrast, for those who are quantifying progress, revenue is a top metric -- survey results indicate 33 percent of CEOs measure digital revenue. While the whole C-suite is likely to be engaged in digital growth planning, more chief executives will seek qualified technical guidance. "CIOs should help CEOs set the success criteria for digital business," added Mr. Raskino. "It starts by remembering that you cannot scale what you do not quantify, and you cannot quantify what you do not define." Many CEOs say that being open-minded, entrepreneurial, adaptable and collaborative are the most-needed leadership qualities. Besides, wise CEOs might consider elevating their digital business ambitions, plus task a savvy CIO or CTO to guide them and track the appropriate success metrics. "CIOs should also help them toward more-abstract thinking about the nature of digital business change and how to lead it," concluded Mr. Raskino. "The disruption it brings often cannot be dealt with wholly within existing frames of reference."